Harrison Lake Harrison Lake is located in Fulton County. This cozy lake covers 105 acres of fishing water with 3.5 miles of shoreline. 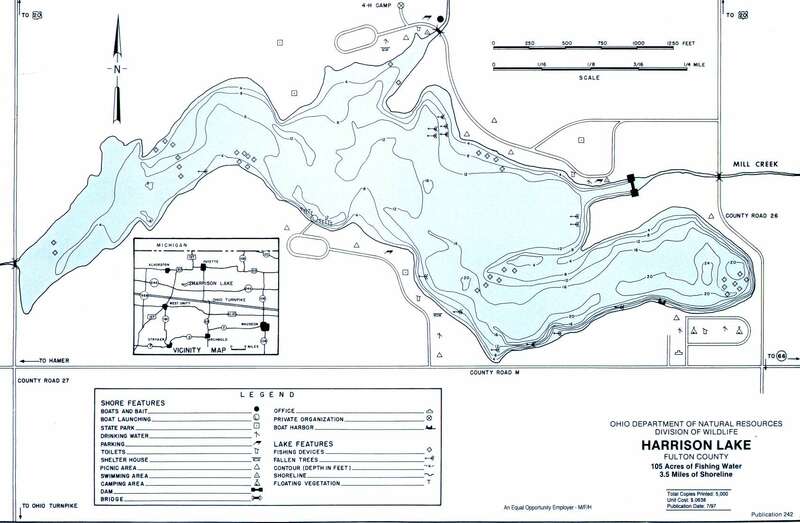 Harrison Lake is in Ohio Division of Wildlife District Two(2). Location Harrison Lake is located in Fulton County approximately four miles south of the Ohio-Michigan border. It is approximately two(2) miles south of US Route 127 and about 6 miles north of the Ohio Turnpike I-80. Distance from Major Cities Approximately 40 miles west of Toledo. Approximately 25 miles north of Defiance. Approximately 20 miles east of the Ohio/IN border. Fishing Opportunities Harrison Lake contains; *Largemouth Bass *Bluegill *Bullhead *Channel Catfish *White Crappie. Boating Information There is an electric motors only restriction on this small lake. One launch ramp is located on the south side near the 4-H campground. State Management The Division of Wildlife activities include ~ monitoring fish populations ~ physical and chemical water analysis.